Simply put, go see Sicario. Run to see Sicario. Buy your ticket, take your seat and strap yourself in for one heck of a wild ride. A haunting score, stellar camera work, a solid, multidimensional script and exceptional performances by Emily Blunt, Josh Brolin and Benicio del Toro make for a total, awesome movie going experience. Set in Arizona, El Paso and Juarez, Mexico the film explores the seedy underbelly of the drug trafficking world, in a way that it hasn't been traversed before. Blunt, sans accent, is an experienced FBI agent that enters the movie, during a raid on a drug house that goes horribly wrong on two counts. Not long after the dust settles, Brolin comes along as a CIA operative on a mission to take out the head or the serpent who is hiding somewhere in Mexico, but he needs Blunt's help for legitimacy and as possible future bait. First, they quickly caravan into Juarez to bring home the number three kingpin (and get out with everyone alive), in order to draw out number two in the US, who will go back to Mexico and lead them to number one. Dead set on taking out number one is del Toro, a Mexican native who had prior dealings with the snake, that cost him his wife and daughter in a most violent way. A man of intensity, few but well chosen words, he will stop at nothing to achieve his goal. Movie goers will want to look away on several occasions as the situations become more than real. The tunnel scene is a masterwork of a sequence that makes you feel that you are actually there. It is a taught, tightly wound thrill ride that locks you in, carries you up, down and throws you out onto a seriously long roller coaster ride that makes you queasy, close your eyes, and tense up with anticipation. Not too many twists, turns or surprises here. 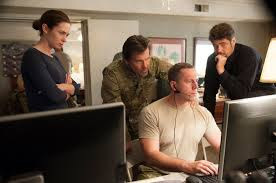 Blunt's character is used to doing her job by the book but figures out quickly that the CIA and their invited guests do not follow any such rule or playbook. Quite the contrary. Her Conscience tells her to walk away, but a total sense of duty and a desire to make a difference keeps her along for the ride. The dilemma intensifies when as she learns that those working around her so not have even the slightest touch of a conscience. The reality that is Juarez and the drug war are the juices that keep this film humming right along, in all of it's glorious, realistic horror. Enjoy the ride.